A good shoe insole can help eliminate foot pain, knee and hip pain and some swelling of the feet and ankles. With so many available, it’s a good idea to narrow the options based on your goals for the insole. We’ll review several for stability, greater comfort, and support. Most insoles are produced with options for men and women, and then by size and specific need. The Powerstep ProTech, full-length insole is made for both men and women in sizes Men’s 12-13 1/2, Women’s 14-15 1/2. The Powerstep has features that include full length, double layered orthotics. It also has the Poron heel comfort cushion, giving your foot full, comfortable support to help you through your day. The Superfeet Green Heritage Insole is a synthetic, man-made insole with a high arch for maximum support, manufactured in a wide variety of men’s and women’s sizes.These insoles fit most roomy shoes once you remove the factory insole. They have a natural NXT anti-bacteria coating, are latex-free and use all vegan materials.The durable construction of these insoles includes four well placed shock absorbers, helping with foot pain, plantar fasciitis, arch pain and heel pain. Powerstep Unisex Pinnacle Maxx Insole is manufactured in a unisex style and comes in a variety of sizes for both men and women.Made of synthetic materials, this insole has a firmer foot arch support, creating greater stability for the wearer.These insoles also offer a slightly angled exterior heel platform, offering greater control of movement. The variable cushioning technology allows for targeted comfort in the foam base.The anti-microbial top fabric will keep your feet comfortable and dry, preventing friction and heat while worn.These insoles are completely moveable from one pair of shoes to another, reducing the investment needed to have comfortable, supportive shoes at all times. Superfeet BLUE Premium Insoles are available in men’s, women’s and junior’s sizes.They are a fresh blue color and are made of synthetic, latex-free and vegan materials with a natural NXT anti-bacteria coating. These insoles provide medium arch support and can be placed in almost any shoe, even those shoes that do not allow for much extra space.These are a great help to those who suffer heel and foot pain, arch pain and plantar fasciitis. The durable construction adds comfort and structure to any shoe. Powerstep Full Length Orthotic Shoe Insoles Original are made for just about any foot issue one might experience but are particularly helpful with flat-footedness or collapsed arches, which can lead to shin splints and other issues.This is the original design (as alluded to in the name) that spurred the design and manufacture of all other Powerstep insoles. They feature firm but flexible support shell with a heel cradle and arch support. With a low-profile design, they fit most shoes, even those that do not have a removable insole.They are also made to be moveable from shoe to shoe. The Powerstep Originals are very comfortable and can improve the way your legs and feet feel the very first day of use. 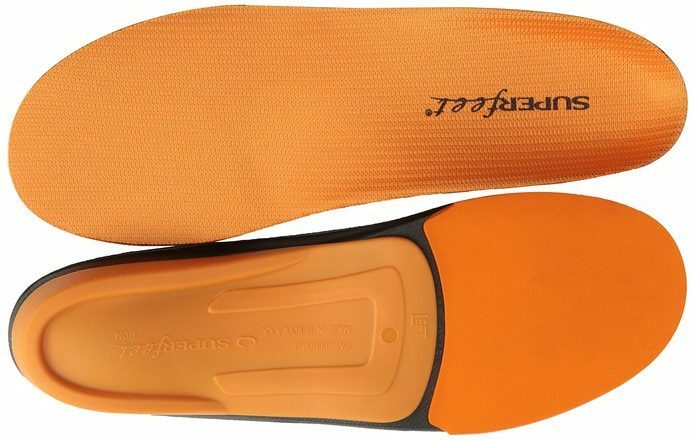 Superfeet Premium Orange Insoles are perfect for those who are high activity. Made to support an active wearer through a long work day, sports, or other high impact activity, the Orange insoles from Superfeet will mold to your foot to provide premium support to the heel and arch areas.Fitting roomier shoes with removable insoles such as work boots, sneakers or hiking boots; these insoles measure 2 inches high and 4 inches wide. Many people purchase these insoles to help with foot pain, arch pain, heel pain and plantar fasciitis.These insoles are also equipped with natural NXT anti-bacteria coating to fight foot odor, are latex-free made of vegan materials.They are high impact foam with a cushion under the ball of the foot, making them quite comfortable. Both brands are made of high-quality materials to provide long-lasting relief from a variety of foot and leg ailments.While Superfeet offers a great many options from which to choose, selecting the right one is simple if you follow the guidelines presented by your doctor. They address all foot issues and are made of high-quality materials. Powerstep also has a wide variety from which to select your insoles, and they have the reputation of being the Number 1 insole recommended by podiatrists.Selecting the Original will never let you down, but choosing another Powerstep option based on your needs will allow for the best possible results.Powerstep is made with great quality synthetic materials and they also feature a soft, odor eliminating cover. Powerstep designs often include a hard bottom and arch support. While this is very good for your instep, it often takes a while to break in the insole before it is comfortable. Superfeet tend to have a narrower heel, making finding the perfect fit a bit more difficult if you have a wide heel. Powerstep is innovative in design. Some of their products feature shocks to help absorb energy and defray friction. They are all made of synthetic materials and are covered in an anti-bacterial covering.Superfeet also features high-tech design in their insoles. Most feature newly developed foam which conforms to the shape of the foot, making them comfortable while providing support. The shape of the insole puts bio mechanical support where it is needed, but takes up less space in the shoe than other brands. In all honesty, both of these brands are very durable. They are well made with similar materials. Durability in most cases will come down to the user and how much or little the insoles are used, whether the appropriate insoles are purchased for the shoe, and whether the shoe itself provides any support or the insole is the main support of the foot.If we had to choose, we would select the Powerstep, as it appears to hold its shape a bit better and longer than the Superfeet. Most people purchase insoles for health reasons. Either they are on their feet for extended periods of time, resulting in sore feet at the end of their day, they are purchasing poorly constructed shoes for looks and need insoles to provide support, or they have a foot health issue that required insoles. Some common foot issues that might require an insole are: plantar fasciitis, flat feet, collapsed arches, shin splints, and generalized foot, heel and ankle pain. When researching the appropriate insole, make sure the one you purchase actually addresses your issue, as each brand presented here offers a wide variety of insoles. A good quality insole such as the ones made by Powerstep and Superfeet can offer protection from a variety of common foot health issues. Of course, foot and heel pain are a given, but have you considered that a good insole can protect you from shin splints, calf pain and even lower back pain? Many people report improved shin and back issues after just a few weeks of wearing an insole that provides heel stability, cushion under the balls of the feet and especially arch support. Powerstep insoles are made with an anti-microbial top layer that prevents foot and shoe odor from developing. Superfeet insoles are also equipped with a natural NXT anti-bacteria coating, and are latex-free, allowing feet to breathe while also preventing odor causing bacteria to build up. Both Powerstep and Superfeet come in a variety of sizes to fit most shoes. Pay close attention when ordering, as some will not fit in a smaller shoe, such as a ballet flat. Superfeet are color coded to aid in selecting the proper fit. Both Powerstep and Superfeet provide a range of products to help with common foot ailments. Powerstep is the Number One most recommended insole, and we agree that their products provide a great deal of support, alleviate pain and even produce better health outcomes for folks who suffer from plantar fasciitis, shin splints, and even back pain. Much of the same can be said of Superfeet, but from our testing and experience, we truly feel that the Powerstep Original is the best of the best. It fits in a wide array of shoe styles, including dress shoes, due to its ultra-thin design. It addresses a great many of the foot and ankle pain issues for which an insole is used. They can be moved from shoe to shoe, saving you money since you won’t need to buy multiple pairs of insoles. And finally, they are designed to support and protect your feet whether you are running, standing or walking.